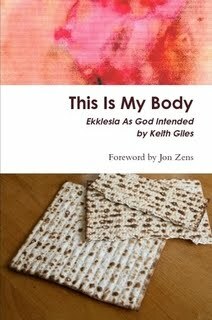 Rethinking Faith and Church: "This Is My Body: Ekklesia As God Intended" by Keith Giles. A Book Review. Suggesting CLOSING DOWN is not the way to get folks in the organized church to read it....so who is the target audience? I do hear what you're saying, friend, but I do not see this as "Keith's agenda." Rather, I think Keith would probably call this "God's agenda" for the institutional church. It would be interesting to see if you still thought the same way after actually reading the book. Thanks for the comment, Phil. Blessings. Phil: If you read my book you'll see that the ideas presented are all 100 percent scripture-based, not Keith-based. My book is available for free online at www.WeAreTheTemple.com so there's no real reason for you to remain ignorant about what I've written. I'd love to know what your thoughts are after you've actually read my book.